Women refugees and migrants in Serbia have got a place of their own and a support team to help them build a post-conflict life free from violence and poverty. “This reminds me of home. We used to have our own hall for women only where we would gather every other day, organize different celebrations and courses and exercise.“ So says Sayarah from Afghanistan at the opening of the Women’s Center in ADRA Community center in Belgrade on November 1 with support of UN Women Serbia. 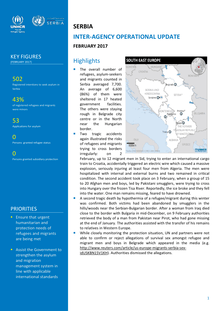 The number of new refugees, asylumseekers and migrants present in Serbia continued dropping to 4,245 counted on 31 August. 3,903 (i.e. 93%) of them were accommodated in 18 governmental centres across the country, while smaller groups were observed in border areas or Belgrade. 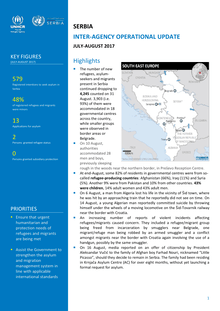 On 10 August, authorities accommodated 28 men and boys, previously sleeping rough in the woods near the northern border, in Preševo Reception Centre. On 30 May, a new Reception Centre (RC) in Vranje (South) accommodated a first 135 refugees/migrants, all families and/or unaccompanied and separated children (UASCs), who were all voluntarily transferred from Presevo Reception Centre (RC). 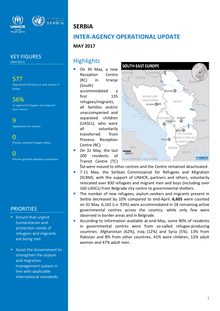 On 31 May, the last 200 residents of Transit Centre (TC) Šid were moved to other centres and the Centre remained deactivated. 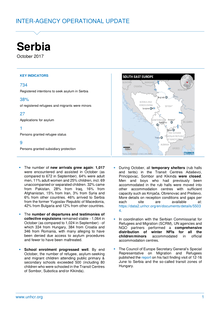 The number of new refugees, asylum-seekers and migrants in Serbia continued to stabilize. 7,364 were counted on 30 April. 5,985 (i.e. 81%) were accommodated in 18 governmental centres across the country, while the rest were counted squatting mainly in Belgrade City. Based on all available information, 43% of those accommodated were children, 42% adult men, and 15% adult women; 57% originated from Afghanistan, 19% from Iraq, 13% from Pakistan, 6% from Syria and 5% from other counties. The overall number of refugees, asylum-seekers and migrants counted in Serbia averaged 7,800. An average of 6,700 (86%) of them were sheltered in 17 heated government facilities. The others were staying rough in Belgrade city centre, in the North near the Hungarian border and in the West near the border with Croatia. The overall number of refugees, asylum-seekers and migrants counted in Serbia averaged 7,700. An average of 6,600 (86%) of them were sheltered in 17 heated government facilities. The others were staying rough in Belgrade city centre or in the North near the Hungarian border. 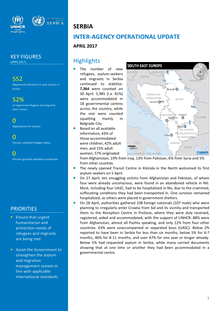 The number of refugees, asylum-seekers and migrants accomodated in asylum, reception or transit centres grew from 5,800 to over 6,400. 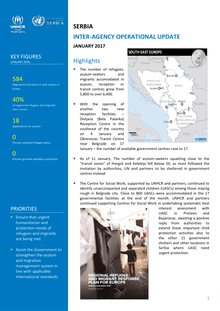 With the opening of another two new reception facilities – Divljana (Bela Palanka) Reception Centre in the southeast of the country on 4 January and Obrenovac Transit Centre near Belgrade on 17 January – the number of available government centres rose to 17. 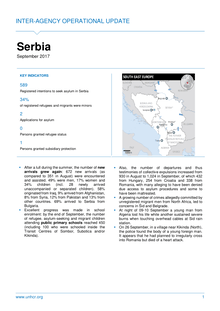 Belgrade, 14 September 2015 - The UN in Serbia is planning another joint fact finding mission to the Serbian-Hungarian border on Tuesday amidst rising worries about deteriorating conditions for thousands of refugees transiting Serbia every day. The Resident Coordinator of the UN, Irena Vojàčkovà-Sollorano and the head of the UN Refugee Agency (UNHCR) in Serbia, Hans Friedrich Schodder are not only concerned about the closure of the Hungarian border but also of deteriorating weather conditions.